1. 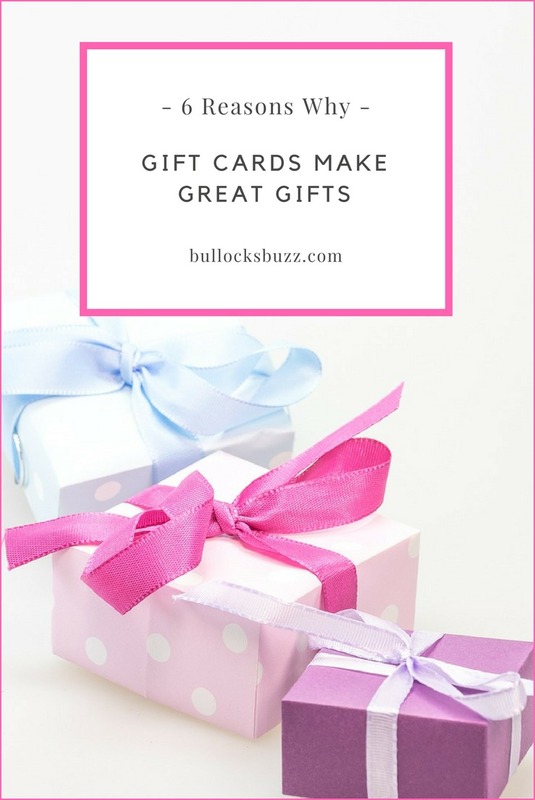 Gift cards can save you the hassle of a hectic trip to the mall, braving the traffic, driving around searching for a parking place, and the time you lose waiting in line – especially during the holidays. 2. Gift cards practically guarantee that people will love what you give them. They allow the recipient the freedom to pick out whatever they want. And, as a bonus, you’re spared the stress of finding that perfect something. 3. They’re a great choice for picky people. Again, the recipient can pick out whatever they want or need! 4. Because gift cards are an “anytime” gift, the recipient can choose to use them whenever they want. 5. Recipients can use them during sales and extend the value of the card. 6. Gift cards can provide an experience. I don’t know about you, but for me a date night out on the town makes a better gift than a knickknack!